So you must be wondering what on earth there is to do in Neopia during October, a chilly and dark month leading up to the scariest day of the year, Halloween. Sure, there are pumpkin patches to visit, costumes to be arranged for your Neopets, even some pre-holiday candy snacking to partake in. But there are tons more ways to celebrate this occasion, though I feel obligated to warn you that most, if not all, of them may result in a scream or two. I don't know about you, but I can't think of anything scarier than a haunted graveyard full of ghouls in the middle of the night, with only a flickering lantern to guide yourself around. Oh, and did I mention that the occasional tombstone has been known to leap up from the ground and chase you? Yes, nothing screams Halloween more than the Mutant Graveyard of Doom II. And who knows, if you play you may just escape with your life, or a nifty avatar. Nothing is more frightening than those monsters in the Haunted Woods who demand grisly items and information in exchange for a prize, though one can never be sure if they even want to know what the prize may be. But in the spirit of Halloween, why not visit the moaning Esophagor or the ever pulsing Brain Tree? Or perhaps if you're feeling hungry, doing a favor or two for the cackling witch Edna might earn you a squeamish snack. Edna has also been known to give out an avatar upon the completion of a quest if you're lucky - and what better avatar could there be to use this month? "Come again?" You say. Yes, You heard me right. That lovely little glimmering pool of ever-changing colors and wonder in the central of Neopia could be just the place to hang out if you have a Halloween paint brush. I must warn you though, your pet will not come out in a nifty trick-or-treating outfit, by any means. In fact, this pool could turn your otherwise cute and cuddly Neopet into a monster, a werewolf, a vampire... even a pumpkin. Some of the most grizzly looking Neopets are a direct result of this paint brush. Sidney, the slithering and slurring Kiosk owner of the Deserted Fairgrounds gets lots of business during the Halloween season - why not give him some of yours, too? For 1200 NP Sidney will slide you his tattered, unnerving version of a scratch card. While Sidney's prizes are often worth the otherwise uncomfortable visit to his stand, he does seem to take great delight in those who do not win... I would also make sure you have a firm grasp on your wallet. He's been known to pick a pocket or two. Just as its name suggests, this wheel is not for the faint of heart. Unlike most other wheels, this one is overloaded with results and prizes you hope you really don't land on. Assembled with old creaking bones and decorated with cobwebs and soot, it has been known to send a Neopian or two carefully tiptoeing away in worry. But in the spirit of Halloween, why not give the wheel a spin? With a little Halloween luck, you may just win a prize worth receiving. It can't all be bad, right? Most of the Carnival's visitors find themselves there by a terrible twist of fate and the most unfortunate of luck. You see, the fairgrounds have a tendency to be rather dark, and one doesn't always notice that below the glowing and inviting "CARNIVAL" sign reads (in blood, might I add), "of Terror." But if you're really looking for a scare this Halloween, you might decide to visit on your own terms - knowing full well that there are evil robot Chia Clowns... running after you. All myths and ghost stories aside, Halloween would not be so scary if we were not reminded of the very real and very alive monstrous and villainous creatures that inhabit Neopia. The Gallery of Evil will provide a detailed picture and an extensive biography of each evil creature known to date, though of course some of them haven't been spotted in years. You may also learn some valuable information, should some of these villains decide to go 'Trick Or Treat'ing this year. I hear that Neopia tends to get rather strange on Halloween. Wait a minute, wait a minute. Halloween isn't just about the goblins, ghouls and ghosts, is it? How could anyone forget... Halloween is also about delicious treats and candies! So go swing by the Haunted Marketplace for some shopping, either to stock up on your own candy or to get ready for the hurdles of Neopets that will be knocking at your door come nightfall. Just mind your step and be sure not to knock over any of the tombstones while shopping. 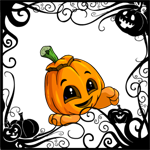 Did you know that there are tons of Halloween themed Neogreetings for you to send and receive to and from your friends? If you're feeling the Halloween spirit, why not pass it along and send a greeting card to a friend? Sometimes a little spooky sentiment is all someone needs to get in the Halloween mood. You can choose between friendly fall wishes and terrifying animated cards. Perhaps not everyone is interested in being chased by tombstones, throwing pies at evil clowns and running errands for maniacal witches. In that case, the Haunted Woods Colouring Pages are the place for you. They are just as friendly and safe as they are spooky - a perfect combination for a pleasant Halloween. While there has been a rumor that one or two of these outlines came to life once they were fully coloured... I'm sure you will be absolutely fine. What's the harm in a little Halloween creativity, right? Well, folks, I hope this guide adds a little spook and mystery to your Neopian Halloween!